As we all know, Arch Linux isn't the distribution with an easy installation. And if I say "easy" I mean easy for most Linux users and maybe new Linux users. I know we have a great Beginner's Guide in the wiki which is awesome if you follow these steps and understand each step. But for the most users these steps are a show stopper and they won't even try Arch Linux even if it's the distribution they were looking for. I think there are a lot of Linux users out there who want to try Arch, but fails with the installation. And even those should have a chance to try Arch. A german Linux news site made an article about Evo/Lution. Evo (founded by Jeff Story) is an Arch Linux Live CD with a CLI installer. The installer reminds me at our old CLI installer we had some years ago, which was removed in 2012 because of the huge amount of maintenance. Since then you definitely have to know what you are doing during the installation of Arch Linux. This huge gap is now closed with Evo. You are guided through the whole installation, each step of the installation is described in the installer, even the choice of a desktop environment is provided. So after the installation you have a fully running Arch Linux installation which is booting directly into the graphical environment. You don't have to worry about commands and their parameters, this is all done by AIS. The project itself is very new and I have tried the Evo-AIS-0.3-RC2-64bit ISO image. I don't know in which direction this project is going, but at the moment it's a very good alternative to install a pure Arch Linux without the hassle of reading through the whole Beginner's Guide. BUT one thing must be clear, after the installation you are on your own and you have definitely learn how Arch Linux works. But if you need any help after the installation process, you can find all information in the wiki or in the forum of Arch Linux. Conclusion: If you want to learn Arch Linux from scratch use the Beginner's Guide from our wiki. If you are familiar with Linux then use our own installation process. 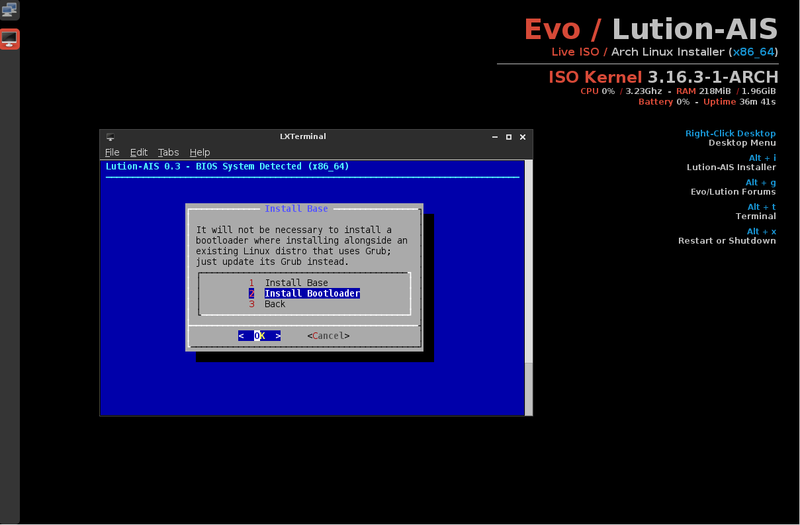 If you are looking for a fast way to try Arch Linux and don't want (or like) the actual installation process, then try Evo/Lution-AIS (at least the Evo-AIS-0.3-RC2 ISO image, maybe the project is moving forward and change their main intention, which is at the moment the Arch Linux installer). Let's hope I don't double post again. As the developer of the Evo/Lution installer, I just wanted to thank you for your kind words about the project, which is - and will always be - pure Arch. Sorry about the disrespectful comments posted in response. I doubt they reflect the majority of Arch users who appreciate the work and dedication of developers like yourself. Oh well, I guess resurrecting the Arch Installation Framework is out of the question, then! You're welcome. You did a great job on the installer so far, so you have earned those words! It's good to hear that you decided to use always a pure Arch, this should be helpful for the users. Don't worry about those comments, there are always some people who think that they know more or know better than someone else and that they don't accept other people's opinion. You dealt with it very well... likely better than I would have in your place. I noticed you mentioned about the future direction of the installer. If there is anything you feel is important (e.g. features to add or to avoid, etc. ), then your views (unofficially, of course!) would be most welcome. Can some one provide a torrent .?? ?